The 2014 tour season officially started today with guide James Derheim greeting return guests Rick and Linda Skauge and Elisabeth Anda along with first-time EF guest Dale Anda to the great city of London to start their eight day tour with James here as well as in Paris. 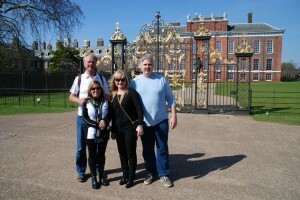 A beautiful spring day greeted the foursome as we walked off the cramps from the flight by exploring Kensington Gardens and Hyde Park along with a walk past Buckingham Palace before a typical pub lunch. It’s good to get a pub lunch out of the way early, because now we don’t have to go back for the bland food. Tomorrow, we are going to get some curry! Rick and Linda last traveled with James in Italy a couple of years ago. Elisabeth has been with James to Ireland and London and Italy with our associate guide, and Dale is on his first trip with EF. Posted in England Tours, Europe Tours and tagged 2014, anda, arrival, england, first, in, private, season, skauge, tour, tours.